Language offers opportunities to explore new cultures Learning a foreign language is challenging, but it has a variety of benefits. 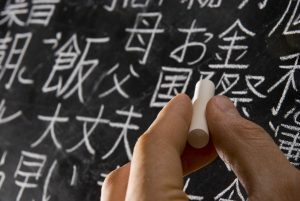 Among the numerous languages in the world, Japanese is highly recommended for its plentiful and unique advantages. First of all, Japanese is not as difficult to learn as you think. Although many assume the language to be very challenging due to unfamiliar characters and pronunciation, you will be surprised that it is much easier than it seems. Compared to Chinese, Korean or other Asian languages, Japanese pronunciation is fairly simple — most sounds end with a vowel. And although it is no lie that memorizing kanji can be difficult, many people start out reading hiragana first. For Westerners, it may be helpful that English words such as lunch, cereal, cycling and many more are used on a daily basis in Japanese. Basic Japanese conversation can be easy to grasp, even for beginners, and casual conversation can be understood even with an ambiguous structure without the subject. The number of Japanese living in Japan who can communicate in English is relatively small. According to Education First (EF), the English proficiency of Japan is 30th in the world — ranked higher than Taiwan, Hong Kong and China, but bettered by Korea, Vietnam and Singapore. In a conversation between native English speakers and Japanese who speak English, the common language would naturally be English. But the chance of you encountering Japanese people who speak English fluently is not so high in Japan. Learning Japanese can also be your gateway to cutting-edge technology and pop culture, as well as current events and history in its original language. You would be surprised at how much Japanese anime or manga you might have seen gets lost in translation. Some concepts in Japanese may not exist in your mother tongue, so certain meanings or nuances can be lost. You can even discover new aspects of your favorite series and further appreciate them. If you are a fan of J-pop, it can be an entirely different experience when you sing with total understanding of the meaning and emotion behind those songs, allowing yourself to thoroughly appreciate the music — and even help you become a karaoke star. There are many other benefits of learning Japanese aside from hobbies and entertainment. If you are looking at Japanese companies for work opportunities, whether as an employee or a business owner, being able to communicate in Japanese will help you find great opportunities. The language will let you step into the third-largest economy in the world, where hundreds of billions of dollars are spent on consumer goods and services. There are also many Japanese multinational corporations with branches all over the world. Being able to communicate well with customers, business partners, employers or vendors in Japanese will be the key to this plethora of possibilities. Your circle of friends online will also expand. One could assume that with the extensive amount of content on the web being in English, Japanese web users also engage with the very same online content — however, the reality is quite different. One survey showed that 53.6 percent of content is written in English, followed by Russian at 6.4 percent, then German at 5.6 percent. Japanese placed fourth for 5.1 percent, as it arguably has the most content in Asia on the internet, meaning that there are many information sites that are only available in Japanese. The interaction between English speakers and Japanese speakers is not so active due to linguistic boundaries, but knowing Japanese will allow you to find extremely interesting content that is hard for non-Japanese speakers to find, along with finding new friends to interact with. Your social circle outside of the internet will expand, too. Many Japanese people can be shy — they are friendly, but will appreciate it if you could take the initiative to speak with them in Japanese. Despite the fact that most Japanese people have studied English in junior high and high schools, the majority of them have limited English skills. Even those who are competent enough in English can be reluctant to speak it, whether it is from lack of confidence or humility — “Sorry, I can’t speak English well,” would be one of the most expected replies. You can learn a lot and possibly make new friends by visiting foreign countries, but learning the language will broaden your understanding of cultural differences. Japan is a nation with a unique culture cultivated throughout a long history of its own — there are people from all over the world visiting, studying, working and residing in the country, and with Japanese as the common language, it can lead to a wider perspective on many more different cultures, world issues and ways of thinking. Communicating in Japanese will allow you to set yourself apart from the crowd — especially if you’re coming from the Western hemisphere where popular foreign languages tend to be Romance languages.